Every sign of the zodiac describes a season of life. Each season takes its form from the natural cycles of birth, life, death, and rebirth. The Pisces season is about undoing everything that has gone on before. This season is even beyond death; here we enter a state of non-differentiation where the perceptions of an individuated self don’t even make sense. If you think this sounds incredibly strange; you are right. Words fall short. Mystic poets are the ones who come closest. Perhaps if we step back and look at the wheel of the year, it will help orient us to a good intention for the ineffable New Moon in Pisces that begins on March 11. What is Pisces all about? Spring is the start of the astrological year and Aries is the first sign. Through Aries we quest for individuation. We ask the question: Who am I? We endlessly explore the answers. Then in Taurus, we become attached to this life and this Earth. She welcomes us by offering incredible beauty and pleasure. In Gemini, other people and the diversity of things we can learn and understand multiply into a kaleidoscope of color and sensation. Spring has fully reawakened us. Summer begins with restoration of the soul. Cancer helps us to constellate what we desire within our homes and families. How will this nurture the evolving self? Mid-Summer Leo, we simply get to shine because we exist. That warm Sun affirms we are unique and worthy. The seasons continue to unfold. We learn to choose and select the finest examples of the first harvest while the season of Virgo turns our attention to practical matters at the end of the growing cycle. Fall begins with the days and nights balanced for a short period. Libra asks us to balance individuation with partnering. The mirror of the other gives us a fuller picture of our selves. The further north you go, the more dramatic the season of Scorpio is. Green life dies; the vital energy of plants returns to the roots and we take a soulful journey through the dark. We get to know death. But the journey doesn’t end here. What emerges from death is the significance of the bigger picture. The final four signs are about universal, cultural concepts that are beyond one individual. In the season of Sagittarius, the bounty of harvest and the coming Winter calls forth a reason to celebrate and to know our values. Culture forms around these experiences. Then Winter arrives with a stern Capricorn eye on the bottom line. We define the boundaries of excess and create a map toward mastery. The broad ideas of Sagittarius and Capricorn find a communal home in Aquarius where all those beliefs, obligations, and responsibilities are put to a test. Is that really how we want to organize things? We tinker with our communities; we throw out the old to make way for the new. And then what? What could there possibly be left to do, to experience, to integrate on our way to the next cycle of the year? What role does Pisces have in the big scheme of things? The season of Pisces is about two things: destructuring the past and dreaming about the now. Everything that we learned and created through the previous year must first come undone before we can begin again. Aries can’t muster the energy for its wildly exuberant quest for identity until it feels like this is very first time it has ever been done. And to get there, we need to forget. That isn’t as easy as it sounds. However much we are able or even willing to let go of attachment, we are actually still alive, in bodies, with pasts that follow us around. This isn’t an easy paradox to live with. Releasing form releases a lot of feelings. No wonder we sometimes deaden to the experience through various forms of escapism. The chaos of destructuring can be overwhelming. Perhaps that is why Pisces is also known as the sign of compassion. We need compassion for self and others as we enter this strange state of non-being. The season of Pisces doesn’t last long, usually just one month while the Sun travels through the sign. Recently, extenuating circumstances have heightened the Pisces season. Mercury has been retrograding through Pisces; and Mars has been traveling through Pisces, joined by Venus, Neptune and Chiron. Most of us are feeling it, and perhaps wondering, will it ever end? Yes, it will, and the funny thing is many of us will miss it. There is a special potency to Pisces that comes from a profound ability to dream deep dreams. If we choose, we can let one or more of these dreams guide us through the next wheel of the year, traveling along side us like beautiful ghosts. There, I have found my intention. In this New Moon in Pisces, I open to the dream I will live by for the next year. Will you join me? Sunday, March 10. The day before the New Moon, we are already deep in the mystery of Pisces. The Moon is busy contacting five of the eleven major players in our sky, beginning with a conjunction to one of the rulers of Pisces—Neptune—early this morning. * This is a good reason to stay in bed late and have that one last dream. If you practice intentional dreaming, the night before is a good opportunity to set that intention. Pay attention to the deep unreal and the big feelings that arise today. These are clues to what we are releasing. Gentle compassion helps us through. 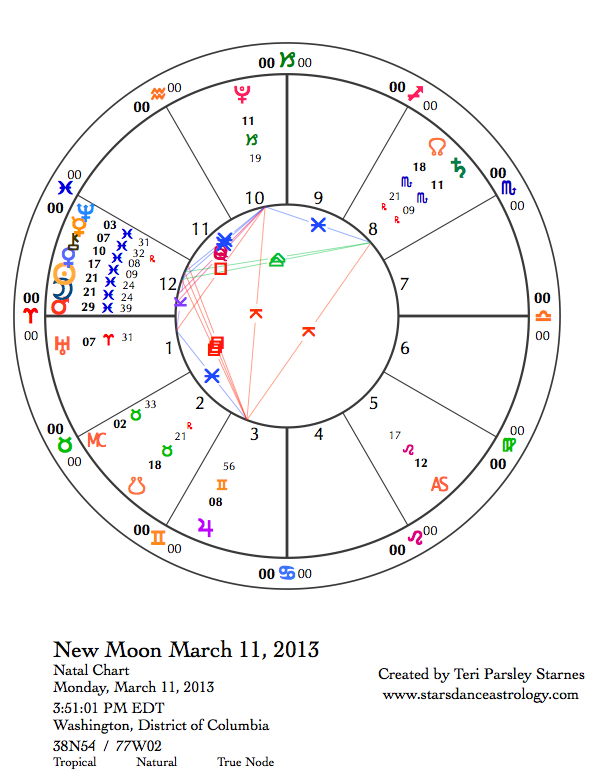 March 11—New Moon: Dreaming. Although the New Moon phase is about initiating a new cycle and new intention in whatever sign it occurs, there is nothing new about the Pisces energy today. Since early February, when Mars entered Pisces, we’ve been deep in the process of Pisces. Already, you may have noticed that you’ve been destructuring elements of your past and receiving mystical messages from the dreamtime. 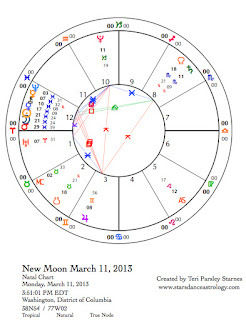 This New Moon isn’t really about beginning that experience; rather I think it is about integrating that experience. The chart for the New Moon shows the Pisces lineup we’ve been dealing with—from the beginning of the sign (where Neptune is hanging out) to the very last degree (where we find Mars). If you have any planets or major points in a mutable sign (Gemini, Virgo, Sagittarius, and Pisces), you are being deeply impacted. The reactions can range from the profound, life-altering experience of enlightenment to the emotion-numbing escapism of addiction. When mutable signs are activated or stressed, it can be hard to focus and we can get over-stimulated. That confusion is telling us we need time to integrate. Rather than zone out in front of the TV, can you take time to be in a supportive environment that honors this profound process? Remember to be kind to yourself. Another prominent feature of this New Moon is that Jupiter in Gemini is square to Neptune, Mercury (still retrograde), and Chiron and is also at the apex of a Yod with Pluto and Saturn. The tendency to be over-activated mentally is very strong. When feelings are big (all that Pisces), it is easy to jump to conclusions and decide what we believe about any situation before us. Pay attention to these conclusions. It may be that they are true, but it also may be that they aren’t. If we can’t fully trust our thoughts, what do we rely on to tell us what to believe? Another place that the Pisces journey leads us to is the realm of faith. How do we act on faith, regardless of doubts, that the heart can be a guide for difficult choices? Tuesday, March 12. Mars breaks free from Pisces and arrives on the scene in Aries today. This may feel like quite a shock to the system, which is not helped by the fact that the Moon enters Aries very soon after. Although Spring doesn’t officially start until March 20, today is a little preview of what that will feel like. Mars rules Aries, so we get a strong boost in energy until Mars leaves Aries on April 20. Jolts of anger might be part of the power boost. Wednesday, March 13. Undercurrents are strong today. Our suspicions may be aroused and we might feel pretty reactive about them. Others are feeling the same way. What can you do to help build trust in those important relationships in your life? What choices do you want to make about the wrongdoing you sense around you? Moon enters Taurus 2:08 pm. Thursday, March 14. Not until mid-afternoon does the unsettled energy of the previous day shift. Be good to your body. Relish in your physical surroundings. Let beauty inform your dreaming. March 15—Crescent Moon: Beginning. We are not spirits having an embodied experience. We are human bodies having a spiritual experience. This may be a good thing to contemplate today. The relationship between Pisces and Taurus is an important and supportive one. How does your body inform you about the dreams that want to accompany you through the next year? Saturday, March 16. How much of a sense of humor do you have? Mercury is stationing, getting ready to turn direct tomorrow. Planets are stronger at their stations. Rather than fear or dread Mercury’s antics, can you invite a sense of gratitude for how Mercury has helped you open to other states of being during these last three weeks? If not, can you at least have a good laugh?